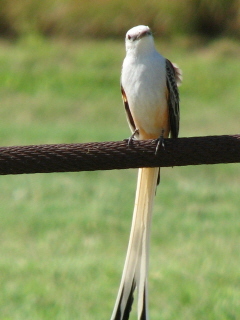 Oct 1 I arrived at work too early, of course, so I stopped by the almost-dry Rio Grande Valley Cemetery pond: Great Egret 9, Snowy Egret 36, Little Blue Heron 3, Tricolored Heron 1, Cattle Egret 2, Roseate Spoonbill 2, American Kestrel 1, Black-bellied Plover 1, Killdeer 6, Black-necked Stilt 8, Spotted Sandpiper 2, Greater Yellowlegs 3, Least Sandpiper 2, White-winged Dove, Mourning Dove, Golden-fronted Woodpecker, Great Kiskadee,Couch's Kingbird, Barn Swallow, Northern Mockingbird, Great-tailed Grackle, Bronzed Cowbird. The Bentsen Butterfly Walk sure was fun Pipevine/Black/Giant Swallowtails, Great Southern White, Cloudless/Giant Orange/Lyside Sulphurs, Southern Dogface, Tailed Orange, Little Yellow, Gray Hairstreaks, Mallow Scrub-Hairstreaks, Clytie Ministreaks, Western Pygmy/Ceraunus Blues, Fatal/RedBordered Metalmarks, American Snouts, Gulf/Mexican Fritillaries, Zebra/JULIA Longwings, Bordered/CRIMSON Patches, Elada Checkerspots, Vesta/Phaon/Pale-Banded/Pearl Crescents, Red Admiral, White/BANDED Peacocks, Malachites Common Mestras, Mexican Bluewing (just one), Tropical Leafwings, Hackberry/Tawny Emperors, Empress Leilia, Queen, Brown/WHITE-STRIPED Longtail, Sicklewinged/Brown-Banded/White-Patched Skippers, White/Tropical Checkered-Skippers, Laviana White-Skippers, Clouded/Fiery/Celia's Roadside/Eufala Skippers, Southern Skipperlings, Whirlabouts, and Common Mellanas. Oct 2 About thirty of us converged on Benito Trevino's ranch in Starr County, drawing on his experience with native plants. Although birds were not our focus, Kyle and I especially could not help but notice them out of the corner of our eyes: Black-bellied Whistling-Duck, Northern Bobwhite, Great Egret, Turkey Vulture, Harris's Hawk, Red-shouldered Hawk, Broad-winged Hawk, Swainson's Hawk, American Kestrel , Rock Pigeon, Eurasian Collared-Dove, White-winged Dove, Mourning Dove, Inca Dove, Golden-fronted Woodpecker, Great Kiskadee, Scissor-tailed Flycatcher, Green Jay, Barn Swallow, Black-crested Titmouse, Cactus Wren, Blue-gray Gnatcatcher, Northern Mockingbird, Long-billed Thrasher, Curve-billed Thrasher, Great-tailed Grackle, Bronzed Cowbird, Altamira Oriole, House Sparrow. Javier and I, among others, noted the butterflies too: Giant/Black Swallowtail, Large Orange/Cloudless Sulphurs, Dogface, GREAT PURPLE HAIRSTREAK, Mestra, Empress Leilia, Snout, Queen, Gulf Fritillary, Malachite, Whirlabout, White Peacock, JULIA, Bordered Patch, Tropical Leafwing, Ceraunus Blue. October 9 Bentsen while Jose and I were walking unsuspectingly toward the park cafe and my surprise birthday party, Jose spied a thick- and short-bodied white dragonfly with banded wings! 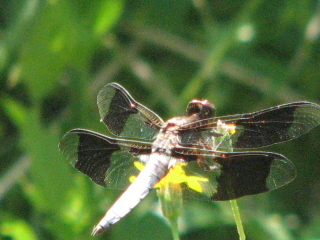 I immediately knew it was a Common Whitetail, because that's a common dragonfly back in Ohio. Abbot's 2004 dragonfly book, however, places it nowhere near the Valley-- I think that Corpus is the closest spot. Anyway, there it was in all its glory posing for pictures, while everyone was waiting to jump out at my surprise party. My first in Texas! They must've been disgusted to see Jose and I wandering through the plants getting pictures of him <laughs>! Turns out, the first one of Hidalgo County was seen by Josh in 2000 at La Sal de Rey. The second was by the Dauphins 6/1/2004 at Bentsen. 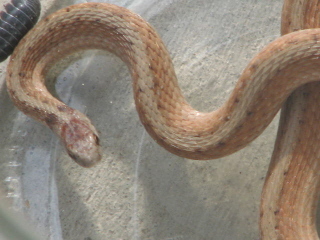 I was also surprised to see that the naturalists' office pet Checkered Garter Snake had been replaced by a Diamondback Water Snake, a creature with an ugly temperament. Oct 12 Bentsen WOOD DUCK 1, Gadwall, Mottled Duck, Blue-winged Teal, Northern Bobwhite, Least and Pied-billed Grebe, Double-crested Cormorant, Anhinga 2, Great and Cattle Egrets, Black and Turkey Vulture, Osprey 1, White-tailed Kite 3, Mississippi Kite 2, Sharp-shinned Hawk 1, Cooper's Hawk 1, Broad-winged Hawk 1, Gray Hawk 1, Swainson's Hawk 1, American Kestrel 1, Sora, Common Moorhen, American Coot, White-winged, Mourning and Common Ground-Dove, Greater Roadrunner 1, Groove-billed Ani, Eastern Screech-Owl, Great Horned Owl, Lesser Nighthawk, Common Pauraque, Ruby-throated Hummingbird 1, Belted Kingfisher 1, Golden-fronted and Ladder-backed Woodpecker, Eastern Phoebe 3, Great Kiskadee, Couch's Kingbird, Scissor-tailed Flycatcher, White-eyed Vireo 1, Green Jay, Northern Rough-winged, Bank, Cliff, Cave and Barn Swallow, Verdin 1, Bewick's Wren, Marsh Wren 1, Blue-gray Gnatcatcher, Northern Mockingbird, Indigo Bunting 3, Red-winged Blackbird, Great-tailed Grackle, Bronzed and Brown-headed Cowbird, Altamira Oriole 5, Lesser Goldfinch. That's my list from "work" today, the day of the nationwide Big Sit. 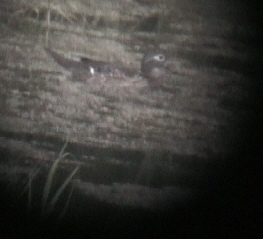 The Wood Duck was by far the best bird, very rare here in South Texas! This is not the entire list (since Josh and Mary Beth relieved us at 1pm), but what Kyle and I saw-- we're missing easy birds like Cardinal and Chachalaca and Olive Sparrow! Oct 13 Bentsen A bird walk this morning was quite pleasant: Gadwall 25, Mottled Duck 6, Blue-winged Teal 200, Plain Chachalaca 1, Least Grebe 4, Pied-billed Grebe 8, Double-crested Cormorant 6, Anhinga 2, Great Egret 1, Turkey Vulture 1, Red-shouldered Hawk 1, American Kestrel 1, Common Moorhen, American Coot, Solitary Sandpiper 1, White-winged Dove 2, Mourning Dove 2, Inca Dove 1, White-tipped Dove 2, Yellow-billed Cuckoo 1, Buff-bellied Hummingbird 2, Ruby-throated Hummingbird 15, Ringed Kingfisher FOUR, Golden-fronted Woodpecker 7, Ladder-backed Woodpecker 3,Northern Beardless-Tyrannulet 1, Eastern Phoebe 3, Great Kiskadee 6, Couch's Kingbird 5, Scissor-tailed Flycatcher 1, Green Jay 20, Northern Rough-winged, Bank, Cave, Barn Swallow, Bewick's Wren 1, House Wren 3, Blue-gray Gnatcatcher 2, Northern Mockingbird 1, Long-billed Thrasher 3, Olive Sparrow 8, Northern Cardinal 3, Indigo Bunting 4, Red-winged Blackbird 50, Great-tailed Grackle 19, Altamira Oriole 4. Best today was Jennifer Hall's find: a caterpillar. But not just any caterpillar: an Asp, also known as a Puss Moth Caterpillar. 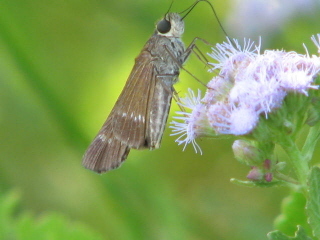 The head and legs are not visible from above. He looks just like a teardrop-shaped piece of fur, this one brown. The most remarkable feature, however, is that this is ONE OF THE MOST TOXIC CATERPILLARS IN NORTH AMERICA. 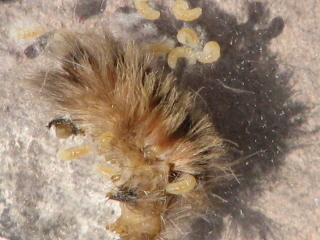 From http://neuro.bcm.edu/eagleman/asp/ "Puss moth caterpillars can pose a genuine health hazard. 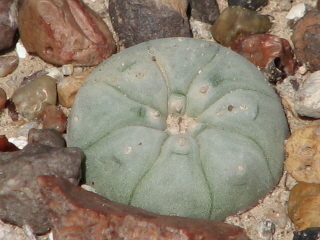 Intense, throbbing pain develops immediately or within five minutes of contact with the caterpillar. Stings on the arm may also result in pain in the axillary (armpit) region. Erythematous (blood-colored) spots may appear at the site of the sting. Other symptoms can include headaches, nausea, vomiting, intense abdominal distress, lymphadenopathy, lymphadenitis, and sometimes shock or respiratory stress. 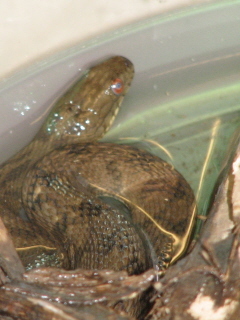 Pain usually subsides within an hour and spots disappear in a day or so -- however, with a larger dose of the venom, it is not uncommon for the symptoms to last up to 5 days. "FIRST AID: An ice pack should be applied to the site of the sting, and oral antihistamines can be administered to help relieve the itching and burning sensations. For caterpillars with stout spines..., try carefully applying cellophane tape to, and stripping it from, the sting site. This helps remove the irritating spines. For allergic reactions, such as generalized itching or difficulty breathing, see a physician immediately. For severe pain physicians sometimes administer meperidine HCl, morphine, or codeine; aspirin is reportedly not effective. Eye injuries should also be referred to a specialist immediately." 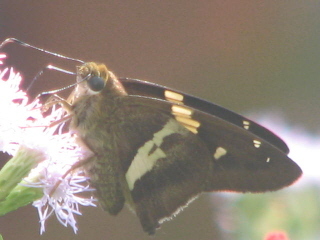 Oct 15 Bentsen 1:30pm was the Butterfly Walk with great fun. Pipevine Swallowtail, Giant Swallowtail, Great Southern White, Southern Dogface, Cloudless Sulphur, Large Orange Sulphur, Lyside Sulphur, Little Yellow, Mimosa Yellow, Gray Hairstreak, Mallow Scrub-Hairstreak, Lantana Scrub-Hairstreak, Dusky-blue Groundstreak, Clytie Ministreak, Ceraunus Blue, Fatal Metalmark, Red-bordered Metalmark, American Snout, Gulf Fritillary, Julia Heliconian, Zebra Heliconian, Theona Checkerspot, Bordered Patch, Phaon Crescent, Pearl Crescent, Painted Lady, White Peacock, Banded Peacock, Malachite, Mexican Bluewing, Tropical Leafwing, Hackberry Emperor, Empress Leilia, Tawny Emperor, Silver Emperor , Queen, Soldier, White-Striped Longtail, Zilpa Longtail, Brown Longtail, Potrillo Skipper, Sickle-Winged Skipper, Brown-Banded Skipper, White-Patched Skipper, White Checkered-Skipper, Laviana White-Skipper, Turk’s-Cap White-Skipper, Julia’s Skipper, Fawn-Spotted Skipper, Clouded Skipper, Southern Skipperling, Fiery Skipper, Whirlabout, Southern Broken-Dash, Common Mellana, Celia’s Roadside-Skipper, Eufala Skipper. 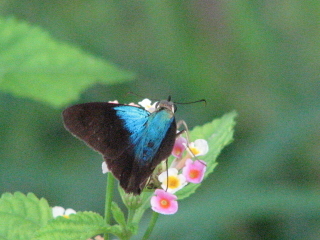 I didn't get lunch today either, so at 4 I asked if I could leave-- a G-I-L-B-E-R-T-'-S F-L-A-S-H-E-R (<--about that color) had been found at nearby NABA Butterfly Park. By 4:30 I had wrapped up things and got there. Rey looked like he was ready to leave, but since they don't close officially until 5, I half ran to the West Indian Lantana where he had been reported, AND THERE HE WAS!!! 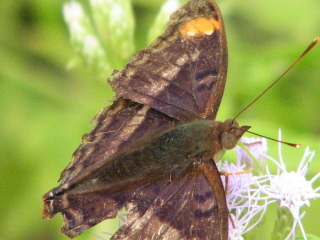 This butterfly occurs rarely in the United States at all, and then only in South Texas. It poured through Hidalgo but about Santa Ana it had dried up to beautiful clouds every shade of blue!!! I hate to say the word beautiful again but... STUPENDOUS! 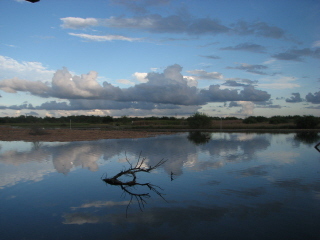 I stopped off 5:30pm at Estero Llano Grande. Earlier today, Mark Klym ran into my office exclaiming, "Who is the bird expert?!!! Who is the bird expert?!!" 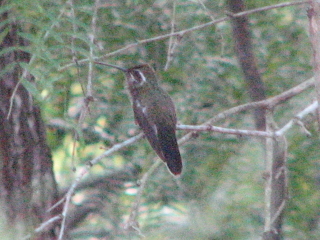 He had taken a picture of an odd hummingbird at 10am at Estero and went all the way to Bentsen to ID it! I smiled, pointed to the book on my shelf he had authored, and replied, "YOU are!" He graciously signed my book ("The Hummingbirds of Texas"), and we determined it was a B-L-U-E---T-H-R-O-A-T-E-D H-U-M-M-I-N-G-B-I-R-D! 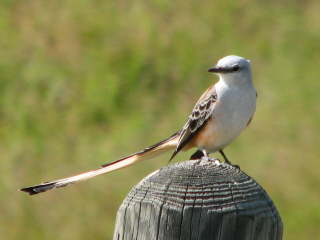 This bird only appears only in the southern parts of the states of Texas, New Mexico and Arizona. Wonderful. Also there was an unusual pale almost white Black-Bellied Whistling-Duck. STUPENDOUS! Oct 16 Bentsen The first day of the Butterfly Festival turns out to be dark and rainy, unfortunately. We did find one good butterfly however: the White Angled-Sulphur. Oct 20 Estero Llano State Park Today I spent the day training in WILD and WILD Aquatic. 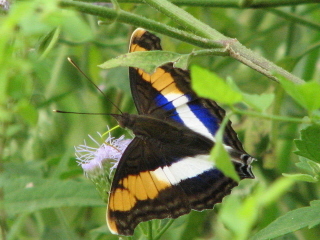 It was great fun, but even better were the birds and butterflies we saw from the deck during breaks: Cottontail, 2 Fox Squirrels, Mexican Bluewing, RUDDy DAGgERWiNg (the first I have ever seen in my entire life and I forgot my card in my camera!!!!! 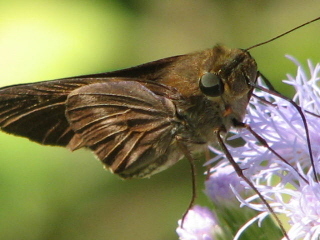 ), GUAVA SKIPPER, the largest Great Purple Hairstreak I have ever seen, Florida White, many Dorantes Longtails, Mazan's Scallopwing. Black-bellied Whistling-Duck 250, Fulvous Whistling-Duck 1, Gadwall 6, Blue-winged Teal 25, Northern Shoveler 2, Least Grebe 3, Pied-billed Grebe 3, American White Pelican 21, Great Blue Heron 1, Great Egret 2, Little Blue Heron 2, Tricolored Heron 1, Cattle Egret 1, Wood Stork 1,Turkey Vulture 1, White-tailed Kite 1, Red-shouldered Hawk 1, Common Moorhen 3, American Coot 6, Killdeer 8, Black-necked Stilt 48, Solitary Sandpiper 1, Lesser Yellowlegs 6, Least Sandpiper 1, Stilt Sandpiper 1, Long-billed Dowitcher 3, Wilson's Snipe 1, White-winged Dove 8, Mourning Dove 8, Inca Dove 9, Common Ground-Dove 4, White-tipped Dove 6,Common Pauraque 1, Buff-bellied Hummingbird 1, Ruby-throated Hummingbird 1, Belted Kingfisher 1, Golden-fronted Woodpecker 7, Great Kiskadee 5, Scissor-tailed Flycatcher 20, Barn Swallow 100, Black-crested Titmouse 3, Northern Mockingbird 3, Curve-billed Thrasher 2, Common Yellowthroat 3, Red-winged Blackbird 50, Great-tailed Grackle 220, House Sparrow 1. Oct 22 Bentsen The morning Nature Tour Gadwall 14, Mottled Duck 10, Blue-winged Teal 100, Plain Chachalaca 15, Least Grebe 1, Pied-billed Grebe 7, Double-crested Cormorant 8, Anhinga 2, Great Egret 1, Black Vulture 17, Sharp-shinned Hawk 1, Common Moorhen 4, American Coot 25, Killdeer 5, White-winged Dove 16, Mourning Dove 2, Inca Dove 6, Common Ground-Dove 3, White-tipped Dove 3, Groove-billed Ani 6, Eastern Screech-Owl 1, Buff-bellied Hummingbird 2, Ruby-throated Hummingbird 10, Ringed Kingfisher 1, Belted Kingfisher 2, Golden-fronted Woodpecker 13, Ladder-backed Woodpecker 5, Eastern Phoebe 2, Great Kiskadee 10, Eastern Kingbird 1, Green Jay 17, Bank Swallow X, Cave Swallow 1, Barn Swallow X, Black-crested Titmouse 3, House Wren 9, Blue-gray Gnatcatcher 18, Northern Mockingbird 9, Long-billed Thrasher 1, Black-and-white Warbler 1, Common Yellowthroat 6, Northern Cardinal 5, Red-winged Blackbird 29, Great-tailed Grackle 28, Altamira Oriole 3. Also nice were five Javelina, two of which were babies, a running Cane Toad and a Russet-Tipped Darner. 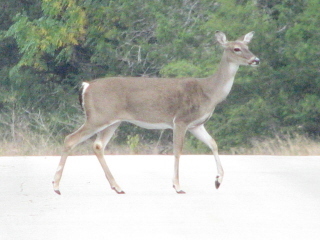 Oct 23 For lunch, Jose and I went to Anzalduas County Park. 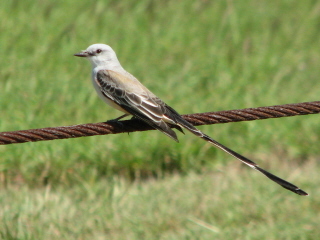 Scissor-tailed Flycatchers were everywhere! Also an Osprey, but the water was too fast for waterfowl. Just a Great Egret and a Cattle Egret. And 300 Rock Doves. Also, Artemio found this great red DeKay's snake! Oct 31 McAllen Enroute to the Halloween party we find the Green Parakeets at their traditional roost on 10th Street, about 6pm. 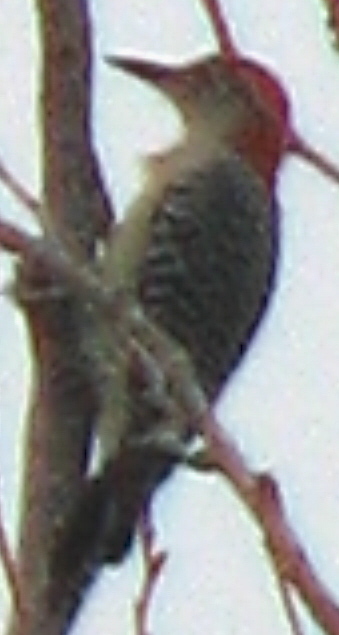 A SharpShinned Hawk flew to the top of the our host's backyard fence during the party, unnoticed by the other guests.